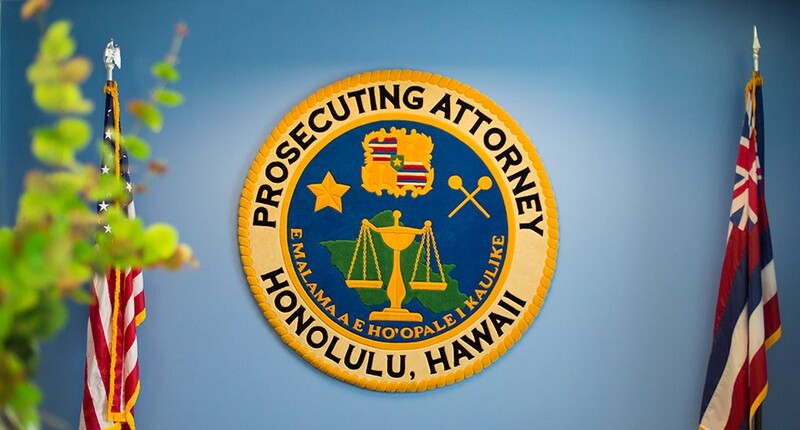 The duty of the Department of the Prosecuting Attorney is to seek justice on behalf of the people of the City and County of Honolulu. The department comprises about 100 deputy prosecutors and about 170 support staff, including paralegals, victim-witness advocates, investigators and clerical personnel. These days, with repeat offenders behind the bulk of crimes in Honolulu, the goal is to take that mission to heart and make sure that every criminal faces justice and that none slip through the cracks. “Effective, efficient” prosecution means attention to every detail in the judicial process, from charging to trial to follow-up tracking. It is painstaking, demanding work and much is being asked of division directors and deputy prosecutors handling each phase of prosecution. But justice is not only about commensurate punishment or incarceration. “Just prosecution” means being fair and doing what is right. It means that cases are charged based solely on evidence, not emotion or expediency. Sometimes it means not bringing charges. In some cases, “just prosecution” can also mean a chance at redemption. Drug Court, introduced by Kaneshiro in 1993, gives first-time drug offenders the opportunity to seek treatment and turn their lives around. If they stay clean, so does their record. This reflects Kaneshiro’s belief that a truly effective prosecutor must do more than take cases to trial; that the prosecutor must be a champion of victims’ rights and the voice of the community in matters of public safety.